An F-35 fighter jet has landed backwards on the UK’s new aircraft carrier the Queen Elizabeth during flight tests off the eastern coast of the USA. 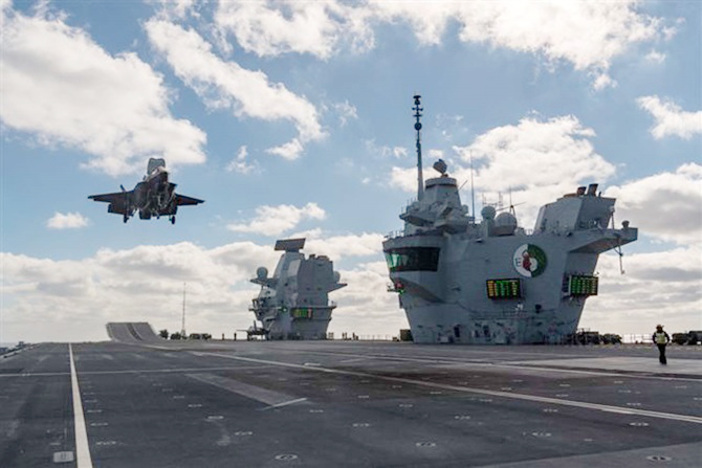 The ‘back-to-front’ manoeuvre, which is described as “like driving the wrong way down a one-way street” is intended to give pilots and the flight deck team more options to safely land the fighter jet in an emergency. During the maneuver, the aircraft faces the stern instead of the bow of the ship, before it is brought down to a hover and moves over the flight deck before setting it down. The F-35B’s nine weeks of operational flight testing on board the Queen Elizabeth carrier started in October and is due to finish in mid-December. The reverse maneuver marks the last phase of the nine-week flight test program. Test pilots have already completed conventional landings and a rolling landing, where the F-35 approaches the flight deck at low speed and gently rolls to a halt, without the need for arrestor wires. The operational tests have focused on assessing how the F-35, the ship and ship’s company perform while launching and landing in different weather conditions and carrying various payloads.